Browse: Home » Alex Salmond at the Accord Centre – A Commitment Unfulfilled? This post features a video recording and written transcription of Scottish First Minister, Alex Salmond’s visit to the Accord day care centre, Dalmarnock, in May 2011. He was invited to the centre to discuss the future of the centre, and the future of day care provision in the East End of Glasgow for people with disabilities, prior to the centre’s closure and demolition to make way for a bus park for the Commonwealth Games 2014. Why feature this meeting now, two years on? First, the video recording has not widely been seen and has quite poor audio quality. We wanted to make sure that everything that was said is made available publically. Second, since the meeting Alex Salmond has been conspicuous by his absence, and the Accord users and carers still have no adequate replacement to use, leaving not just them but the whole East End of Glasgow without a decent day care service for people with severe learning needs. At the meeting Mr. Salmond repeatedly claimed a “locus” on the issue of the Accord centre because of the Commonwealth Games 2014; in other words, a pivotal responsibility, as the Games are 80% funded by the Scottish Government (i.e. us! Scottish taxpayers). 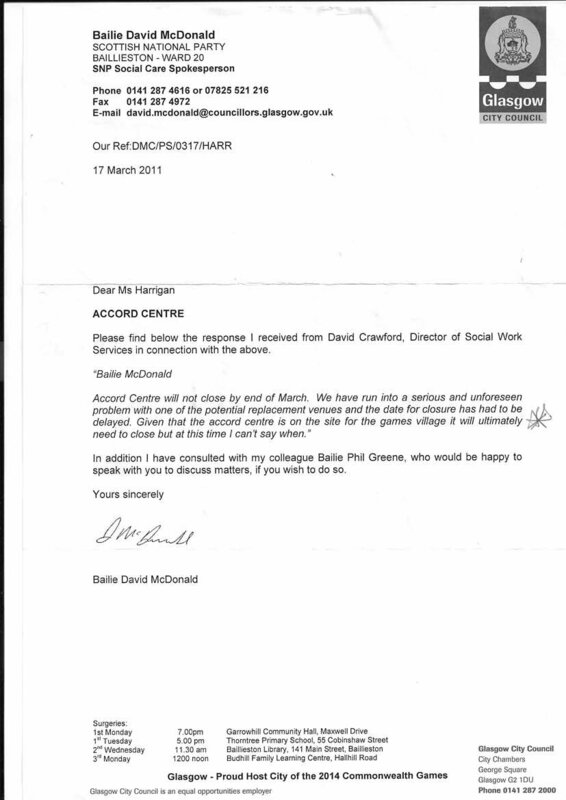 In addition, the Accord centre and its users and carers were definitively displaced because of the Scottish Government and City Council funded Games, as letters from the City Council prove (here and here), despite recent deceitful City Council claims otherwise. Mr. Salmond said at the meeting that he wants a “good feeling” towards the Games. How can that be expected when some of the most vulnerable people in Glasgow have been displaced into vastly inferior facilities at the inadequate Bambury Centre? This despite repeated promises made to the carers by the City Council at a Community Health Care Partnership meeting on May 30th, 2008 that there would be a ‘new-build’ replacement, even if this promise contained legalistic ‘weasel words’ as mentioned in the transcription below? The First Minister should honour the committment he made in a letter (here and here) to the East Carers group, of “ensuring that the Games Legacy includes recognition of the needs of people with a learning disability”. Until that happens the Games ‘legacy’ will be tarnished not just for people with a learning disability in Glasgow, and their carers, but for everyone in the city and beyond. View the video and/or full written transcription below (printable PDF here). The video starts midway through the meeting and finishes before the meeting ends. [Audience] …We met with Archie Graham, the deputy leader of the Council after a protest last week. He said he would look into it, and that he’d come back to us as soon as he could. And, again it’s the type of letter, he can say what he wants, but it’s this thing of numbers dropping off, that’s what they’re hoping will happen, so they can say, ‘there’s no demand for a like-for-like day care facility’. [Alex Salmond] Can I explain to folks that there’s two aspects to this, one of which I’ve got some locus in, some interest in. And one of which is much more difficult, because like it or not, the Council, they have the right to pursue their social work policy, and that’s their policy to pursue. And although I can write to them and say, ‘keep up with this, keep up with that,’ that’s their entitlement to pursue their policy. The area that I have got locus is on the question of the Commonwealth Games. Because the Commonwealth Games is funded 80% by central government; 20% by Glasgow. And obviously I’ve got an interest, as we all have, throughout Scotland, in seeing that everybody has a good feeling towards the Commonwealth Games – that people all feel this is something that the city and the country have a good feeling about. And in these circumstances, what I really would find very useful, is if we could, beyond argument, establish that a like-for-like facility was promised – because if we establish that, then I’ve got locus to say, look, the Commonwealth Games are funded by the country, and I can’t have a situation where there’s a bad feeling towards the Commonwealth Games because the City of Glasgow is not redeeming a promise that was made. And certainly the funding of the Games is on the basis that the people or facilities which were displaced as a result of Commonwealth Games building would be offered an equivalent facility; that was the basis on which the arrangement was made. And although we’re not […] in every case, in the vast majority of cases, that’s what’s been pursued. So if – you know, what the Council appear to be saying, and I have not, I don’t have a reply to my letter yet – they’re sort of saying, well, ‘this has really got nothing to do with the Commonwealth Games, this is our changing approach in our social work policy’. But the fact remains that this is part of the Commonwealth Games site. [Audience] The East Community Partnership. The Chairperson and the Director promised in 2008, and it’s minuted. [Alex Salmond] And you’ve got the minutes? [Audience] Yes. It was also – Iain McAlpine also presented a paper of an update on the modernisation of day services within the East, CHCP [Community Health and Care Partnership], and it’s minuted in that as well (see minutes here). And I can produce them. [Audience] Alex, can I say about the modernization? They’re using that towards the Accord. But in every other area of the city, that closure has happened to a day centre, everybody else got the choice of a day centre. We are the only ones, the only ones, who are not getting a day centre. Everybody else got a day centre. [Alex Salmond] So you could argue that, not only are you not in a better position as a result of being part of the Commonwealth Games site, but in effect from that argument…. [Alex Salmond] What do you believe is the motivation? [audience whisper: ‘money’] If we start from the assumption that they’re not trying to be, you know, be nasty to you, in terms of, for the sake of, being nasty, so what is their motivation? [Audience] They’re trying to blame the SNP government for withdrawing funding…. [Audience] Yes. Yes. Yes, that’s – that’s how they feel. [John Mason, Shettlestone MSP, SNP] I think, too, there has been a fashion to move people out of any kind of institution, into individual care. But what they’re missing is the social aspect of all that. [Audience] It’s the safety aspect as well. [John Mason cont.] And that’s what comes across to me, as the main thing they get here. [Audience] Without a day centre we think adults with disabilities are going to be isolated, carers are going to be isolated, it’s just going to have a knock-on effect. And carers will be even less likely to get jobs. It’s hard enough to get jobs without, you know, within that time limit. It’s…it’s just…you know. [Audience] The big issue behind all this is the Personalisation, Self-Directed Support agenda that Glasgow City Council are introducing just now. And basically they’re short-changing learning disabled people, because they’re going to have to go through a system where they’re allocated a budget, but that budget will not be enough, in the future, to allow them to come to a day centre. They just won’t have enough money. And there’s people who have already been through that system, who have been allocated less than 50% of what their existing care needs are. And it’s basically just short-changing them, and it’s really diabolical. Right. And although there’s, we see from the people here how important it is, from a community aspect, that these people can be here, interact with each other socially, are confident in socialising with each other, and it’s in a safe environment. We actually do need centres like this, to remain open, not be closed down, because of the council’s deciding, ‘oh, people want to go away and do different things with a carer.’ Then they would use the excuse of, ‘oh, people didn’t want to go to a day centre.’ People really do, really value this type of centre. [Audience] …it’s, that’s what they’re hoping for, because they’ll save a lot of money. Glasgow City Council, with their Personalisation policy want to save between 20% and 30% of their learning disability budget. It’s all about money. Now, we realise that that is the case, but people – people really need these things. Learning disabled people are vulnerable people, and they must be protected. And they must have places like this, that will enable them to develop their life skills, develop and be able to integrate more in the community and move forward. Both as an educational experience, and a social experience. It’s really crucial. [Alex Salmond] It should be said, I understand from what John says, that the doctor’s surgery here is also struggling to get offered a like-for-like facility. […] That is not an issue which has to do with the change in the policy, so, that sounds like they just don’t want to redeem the argument for supplying a like-for-like facility. [Audience] Three each. Which is a lot. [Audience] We’ve been asked to extend an invitation to you to visit Riddrie, to see [?]. [Audience] Which is the other centre. And I believe they’re taking 21 [people] from the Accord […?]. [Audience] 22 people. Next Monday. And that’s what we’re trying to stop, and our people have already disappeared out of this centre. And we’re trying to stop that. So people have got the choice. [Audience] See, they don’t seem to realise the pressure they’re putting on the carers as well, with these individual budgets and whatnot. It’s the carers who have to manage the budget, or use some of the budget to pay someone else, which is taking money away from the person it should be going to. [Audience] Aye, I told Alex that, I told Alex that. [Audience] I know, I know we’ve told Alex [Salmond], we’ve told Archie Gemmill, I mean Archie Graham. [Alex Salmond] Archie was the one…[makes gesture to describe Archie Gemmill’s brilliant solo run for Scotland against Holland in the 1978 World Cup]. [Audience] But the point is that the City Council have had two years to get this sorted, and the bottom line is they’re only tackling it now because it got chucked to the Council last week, and they took us in, Archie Graham took us into his office at very short notice, and he says, ‘I’ll look at it, I’ll do the best I can.’ And then, you know, basically we’ve heard nothing since. [Alex Salmond] Well, the council offered, my engagement this morning was unexpectedly postponed, or it wasn’t convenient, they offered me a meeting this morning, but I said I wanted to see you first. But I will see them next week. Now what I’ll do is I’ll take this, and say, look, you know, there comes a point, I have to have a locus, I have to have a reason, and the Commonwealth Games gives me a reason, because it’s something which is largely financed by the Government, by all of us, by every taxpayer in Scotland. So that gives me a locus, because I don’t want, don’t want the obvious ill-feeling there is about what’s happening, spill over onto the Commonwealth Games. So what I’ll do is I’ll use that as a locus, I’ll take this and anything else you’ve got which could help us along in this, and say that, while the language might be, have weasel words in it, the intention from this minute is pretty clear. [Audience] I was trying to say at that time that they had carers out looking at land, that they could choose to build their new centre on, they actually has carers out looking at land. [Audience] That’s how far it went. [Audience] The local councillor, Mr. Redmond, said, ‘we’ll gie you the land for nothing’. Honestly, I’m no kidding. I notice he’s no here today. [Alex Salmond] My policy on capital punishment’s always been clear! [Audience] There is another point. Since Glasgow doesn’t technically own anything now. It’s all owned by City Properties, they have go in and buy it. [Billy McAllister, Deputy SNP Leader] See, I think that’s the stumbling block, Ali. Because of the transfer, and they put them out […], and this is what the big problem is. Because they weren’t even looking at any other options. And it wasn’t till the carers then decided, we’re no waiting on this, we’re gonnae protest, we’re gonnae make people aware of what’s going on here, you know, that they started sitting down and going, ‘oh, come in and talk to us.’ And it was only then that they started saying, ‘well, you know, you give us.’ They havenae acted accordingly, in their remit, to look after these carers properly. What they’ve done is just pass the buck onto them again, and say, ‘well, you give us [property?]’. Now, we’ve done that, Davey McDonald there, councillor for this end, has went and actually looked for the buildings, and said, ‘they’re the three buildings.’ Now, I asked, what’s his name, Davey Crawford, to send me reports on the findings of his investigations. He hasnae come back. And then, it’s just been demonstrated gain…I’ve gave him about three weeks now Ali. You know, I’ve gave him enough time. And it’s, every time it’s, you know, this group decide they’re going to take direct action, that then we get a response. Like Friday, they go, ‘come in and and talk to us.’ They weren’t even concerned to talk to them, they just dismissed them, and said that you will go into community centres, and they’re whittling it down as the time goes on and the clock’s ticking, that they’re trying to destroy them by divide and conquer and all that. And they have to step down, It’s wrong. [Audience] They’re trying to wear carers down. [Alex Salmond] What I’ll do is as follows. I’ll write again to the Council, agreeing the meeting that’s proposed, to the leader of the administration. I shall point out these minutes and the other indications that you have, so that the letter is as strong as possible on that. And I’ll argue that the Government has an interest in this matter because of the Commonwealth Games aspect, because we don’t want to see the Commonwealth Games besmirched by the fact that people are being done down in the East End of Glasgow. I’ll then – I’ll give you the letter, which you are free to issue as subtly as you wish. I’ll then have the meeting with the Leader of the Council, and I’ll try and persuade him that in this particular instance, given the circumstances, and indications, if not absolute commitments that were made, there’s a cause and a reason for redeeming the commitment for a like-for-like centre. And I’ll also, at that meeting, raise general concerns, which I cannot dictate to them incidentally, because it’s not my remit, but I’ll raise the concerns that you’ve put about the wider implications of the policy that’s being pursued. [Audience] Just one other thing […?] about Archie Graham, he turned around and says, he has no influence in this administration, he has no influence in this council. [Audience] Did he say that in the council? [Audience] Aye, he was very cheeky. [Alex Salmond] Well, you would have thought that the elections would have […] brought on a more amenable attitude. [Audience] If on the opening day of the Commonwealth Games, there’s people wandering about with placards. [Alex Salmond] As I say, we – the people, all of us, fund 80% of the Games, and incidentally you fund the other part of the 20% as Glaswegians. [Audience]…The building’s not due to come down till 2013, Alec. [Audience] The building – it’s not due to come down till 2013. [Audience] I think the main thing is, we have to put a stop to service users getting moved to [?]. Now that needs to get stopped today. [Alex Salmond] I’ll, I’ll make – I can’t embargo their policy, but I’ll make the point that unless that’s stopped, it renders the commitment academic. [Audience] Alex, can I give you this? This is from May 2008, when they asked us to have some input in the building. It was, we were gonnae have. And that went towards, that was Jim Coleman and Mark Fineman, who were at the meeting, and they asked us to come up with all this. See also – Save the Accord Facebook page; Games Monitor interview with Accord Carers; and an image gallery of selected City Council and Scottish Government letters to the Accord.